Blog posts : "carbon monoxide"
What are the risks of unsafe gas appliances? If you don't have your gas appliances serviced regularly, if your gas appliances are fitted by incompetent and untrained workers, or if you don't take steps to respond quickly to boiler breakdowns and other gas emergencies, you could pay for your mistake with your life. A security company has been fined for safety failings after a lone working security guard was killed by carbon monoxide fumes from a petrol generator. A landlord has been handed a suspended jail sentence for endangering lives after a mother, her partner and her eight-year-old daughter were poisoned by carbon monoxide at a flat in Lewisham. Two Sheffield landlords have been handed suspended jail sentences after dangerous defects were found on every gas appliance at a house they rented out to a young woman. An illegal gas fitter has been prosecuted for endangering lives by undertaking potentially lethal work at a property in Colchester. A family was exposed to deadly carbon monoxide fumes after building work on a chimney caused a blockage in a flue. A Wigan landlord has been prosecuted for putting the life of a tenant at risk by falsifying a gas safety document. A gas engineer from West Bromwich has been prosecuted after a family of five were taken to hospital following exposure to carbon monoxide. A Tenby landlord has been fined for failing to maintain a gas fire safely within one of his properties. A plumber who put a householder at risk by illegally installing and working on a gas boiler has been sentenced. Trading as C&H Services, Christopher Johnson, 45, installed a new gas boiler in the kitchen of a residential property in Fairfield Road, Dunstable in April 2010. A family was put in danger after a local builder carried out defective gas fitting work while constructing an extension to their home, a court has been told. Newcastle-under-Lyme Borough Council has been fined for endangering people's health after carbon monoxide leaked from a gas boiler at a community centre. 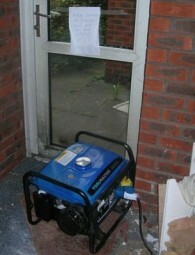 A Walsall landlord has been sentenced for failing to provide a gas safety certificate. The Health and Safety Executive (HSE) prosecuted Khalid Hussain following a complaint from a tenant and her partner, who rent a house at Raleigh Street, Walsall from him. An Accrington man who falsely claimed he was a registered gas engineer has been sent to prison for two years for endangering people's lives at two properties in Lancashire, including a baby boy.